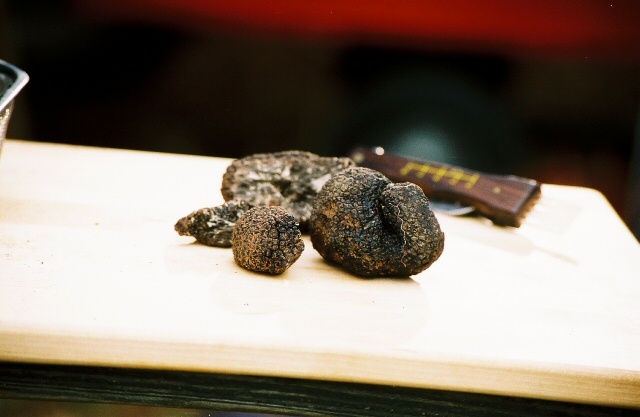 Well, sure enough, we found our first truffles and lots of people were really happy about that! Telling the story has always been really fun for me and showing people pictures of our first harvest was even more so. News spread far and wide -- all the way to New York City! Picture this. December 21, 2006 (less than a month after Truffle #1 appeared) the questions started coming from Martha Stewart - yes, THE Martha Stewart. It turns out that Martha has had an interest in truffles for a long time. She'd like to have a truffle orchard of her own so she's been following the story of Franklin Garland and his success. A member of her staff contacted Franklin to see what's going on with the truffle thing in North Carolina. 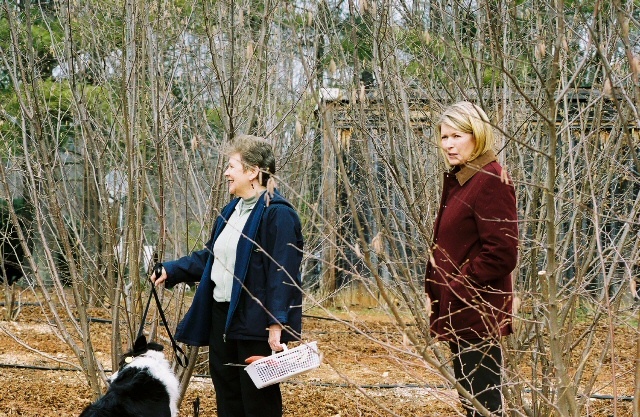 Franklin told her that we were the only people harvesting in North Carolina and, if she wanted to hunt truffles, she'd have to come see the Smiths. Franklin's wife, Betty, called me to see if it would be ok for Martha and her crew to come to our place. I panicked! Can you imagine Martha Stewart coming to your house? I couldn't! It took about 24 hours for me to settle in to the fact that she wasn't coming to see my house. She was coming to see my orchard and that would not be a problem. We were certain there were more truffles in the ground and if she wanted to see how much fun it was to find them, far be it from me to stand in the way. 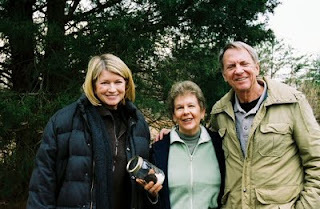 Well, it takes a lot of preparation to film a Martha Stewart show. After several phone conversations and emails, we first met with the field producer and her assistant. The next day we met with them plus the film crew chief and his assistant. The next day (January 10, 2007) all those folks came back along with Franklin and Betty. (It would have been a real crowd but we had not told a soul what was going on. That was hard.) Around 8:30 AM, a van pulled in the drive and several camera crew members got out. They had more camera equipment in that van than I could ever have believed would fit in there. 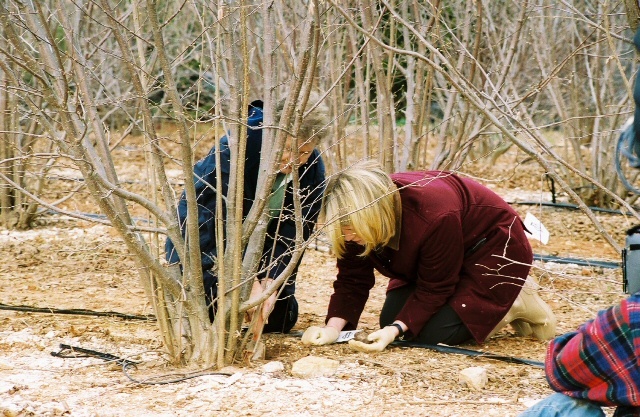 They began to work in the orchard putting monitors here and there and positioning and planning for keeping them all out of sight of the filming area. It was amazing! Then Martha and her support staff arrived about 9:30. We all introduced ourselves and we welcomed them to the farm. I was so excited I could hardly stand it. It was absolutely surreal. Martha and her make-up person went to the living room to do make-up. Franklin started cooking up a truffle omelette in the kitchen for everyone. When he was finished, we had tea and omelette together and then headed out to hunt truffles. First, Franklin talked about the details of planting truffles. He and his dog, Ginger hunted for a little while. When Friday, Martha and I took over, I just let him do his thing. I was so proud of him. Friday almost completely ignored all those people with cameras and just did his job. We found truffles in several different locations. One of them was wound around a root and had to be cut in half to be extracted. That ended up being the one Martha wanted to take home with her. We cleaned them all up and rejoiced over our success. It was absolutely the most fun of my adult life. You never met a nicer bunch of people in your life than Martha and her staff and crew. They were just as cordial and friendly as they could be. But wait, there's more!! Yes, really, The Best is Yet to Come!